I suppose that most users will open it to download a printable score, but the page does not make it too easy. You have to understand that you need to click the PDF icon, hunt for it amid a host of other icons (half of them zoom icons or globes) and repeat this process for every edition you want to view. Lots of noisy links around do not help (no, I don't want to see other editions uploaded on 2016-08-26, thank you very much). Now it is immediately apparent where to click for the PDF. In addition, you see the staff layout, the key, font/language of the lyrics etc. so you can choose the desired score without clicking through to every edition. In order to achieve that, we need to store a 100 KB preview image for every edition and add a simple template to every edition. I can make a bot that will crawl CPDL, generate and upload preview images and insert such templates. What do you think? AlexMyltsev wrote: I can make a bot that will crawl CPDL, generate and upload preview images and insert such templates. What do you think? ChoralWiki makes use of the MediaWiki software, which can automatically create preview images. 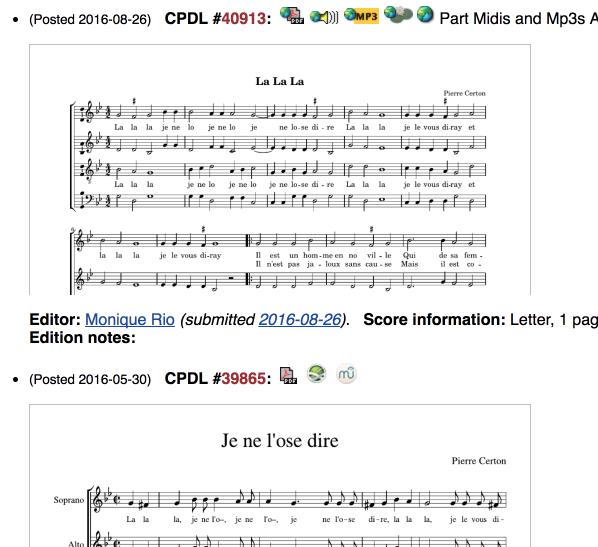 However, ChoralWiki also includes a fairly large number of scores hosted on external servers. Quite often, external score files are not directly linked to the work page on ChoralWiki: one has to manually browse the external website to find the actual score file. To ensure that previews are available, and that they are not obsolete with respect to the externally hosted scores, we would need direct links to all externally hosted scores, in order to get a temporary copy and make the preview "on the fly" (external websites may not allow that we keep a copy on our servers). How do you think this can be done, and maintained over time, taking into account that external websites may change their internal structure, that they can be moved to other domains, etc.? To me, this looks much more confusing: where is the user supposed to click on to download the score? A right click on the preview image would only save the preview image, but not the PDF. choralia wrote: Quite often, external score files are not directly linked to the work page on ChoralWiki: one has to manually browse the external website to find the actual score file. To ensure that previews are available, and that they are not obsolete with respect to the externally hosted scores, we would need direct links to all externally hosted scores[...]. How do you think this can be done, and maintained over time, taking into account that external websites may change their internal structure, that they can be moved to other domains, etc.? I think it probably can't be done, but it should not stop us from providing the best possible experience for thousands of scores hosted on CPDL or directly linked. They can't really "forbid" previewing in the legal sense. Storing and showing a low-resolution preview for the first half-page of a score will be "fair use" under any applicable copyright legislation. But sure, for the sites that want to make things hard for the users and say so, we can generate no previews – good riddance if you ask me. Cdalitz wrote: To me, this looks much more confusing: where is the user supposed to click on to download the score? The preview area is much larger than the tiny PDF icon, so, per Fitts's law, it is that much easier to target and click. And there is less clicking required too, since you can often choose the score just by scrolling through the page and comparing the previews (and scrolling is cheaper than clicking). Even if you do not buy my reasoning, nothing is taken away from you: the tiny PDF icon is still there, you can hunt for it if you like. Thank you for the improvement suggestion. I personally value the less cluttered old way, which requires paging down less, but like the ability to see the previews. Would it be possible to have either (a) the editions listed at the top, kind of like a concise table of contents the way it appears now, and then have the more verbose version farther below for people who scroll or find that more intuitive or, better yet, (b) the user able to toggle on/off the preview to collapse to the concise version? vaarky wrote: or, better yet, (b) the user able to toggle on/off the preview to collapse to the concise version? I don't know how to do that with MediaWiki. Any ideas would be welcome. Thanks! I liked the revised format, even if we can't find a way to toggle previews off or if it's not worth the effort with this new format. Feedback from others on this hybrid interface approach? I mean that I like, present tense, this revised format. Any ideas for improvement are very welcome. By default, I'm going to continue in this fashion. 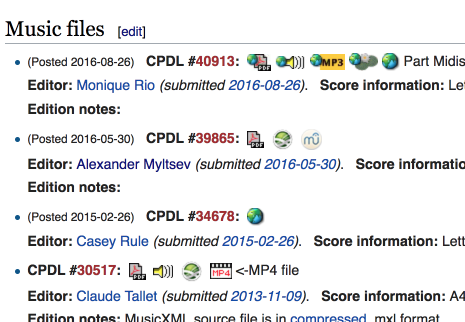 At the very least, the CPDL number and Editor's name should appear, along with the ScoreInfo, beneath each preview. CHGiffen wrote: At the very least, the CPDL number and Editor's name should appear, along with the ScoreInfo, beneath each preview. Yes, the previews look great, you could even say fantastic. After looking at the source code, I am rather disillusioned and fear a maintenance problem. What should a usual CPDL-updloader do if a error is found and therefore a new version has to be uploaded? I would not know how to update the preview. And with the redundant information in the caption (PreviewScoreInfo, PreviewEditor) you run the risk that this will not be maintained in case of changes. In my opinion, you should get rid of the redundant information; the only required preview identification is the CPDL number. so only one line in the source code is needed per preview. Nikolaus Hold wrote: I am rather disillusioned and fear a maintenance problem. What should a usual CPDL-updloader do if a error is found and therefore a new version has to be uploaded? I would not know how to update the preview. 1) My impression is that most editions are "one shot": uploaded once and never updated. If this is true, updating the previews is less of a problem. 2) When an edition is updated, for example an error is found and fixed somewhere in the score, the first half-page will often remain unchanged, so the preview does not become obsolete. Major changes (like transposing or changing the staff layout) that require a preview update will probably warrant a separate edition. 3) When I allow the bot to operate automatically, it will crawl recently changed scores within minutes of an edit, keeping the preview section always fresh. The rate of uploads/updates is not that high. I'm IT illiterate, so pardon me if I'm completely off base, but what about a system like they have at IMSLP, where a preview image is about the size of a postage stamp but enlarges when you scroll over it? Another concern I would have is that some pages have 15, 20, or even more editions. All those previews would create a lot of clutter. Finally, a lot of my editions have title pages. I presume the preview would show only that, so a potential downloader would be none the wiser.